There are a couple of different types of fantasy sports sites that users will come across. One will be more familiar as it is more established, while the other is on its ascent. A new aspect of fantasy sports might be the very thing you're interested in to tackle betting from a different angle. FantasySportsWebsites.com is your gateway to the arena of sports betting that is one of the fastest-growing in the industry. Standard fantasy sports websites are discussed as well, which have millions of dedicated users annually. If there is the ability to play a fantasy league for a sport, chances are that it will be available at a fantasy sports betting site offering users the chance to cash in on the skills used to formulate the best fantasy teams out there. In other words, if you think you've got what it takes to be the best fantasy sports player out there, or want to see how you measure up, these betting sites give you the opportunity to do just that. But what we at FantasySportsWebsites.com are designed to do is to be informative. What types of fantasy sites are there? We break down the two and explain them. Just what are these fantasy league sites available to place wagers on? And furthermore, how are you able to win money by playing them? Is there a difference between these types of leagues and traditional leagues? All of these questions plus more will be answered, as you will be able to see what had led to websites offering fantasy sports so popular. In general, fantasy sports sites have the ability for users to formulate teams through a variety of practices. There is a draft or selection process involved which will determine which players are on your team. The number of teams that players can form will depend on the number of leagues they’re in, and whether or not it's a traditional fantasy league site or a daily/weekly fantasy sports site. Below we explain the two. A website that hosts traditional fantasy leagues can be specific to one sport, or it can have many different sports with leagues offered. These sites allow users to create or join leagues in their desired sport. Some sites offer the chance to play for free, others for cash and prizes. This is typically up to the individual league that a user signs up for, with the rules stipulated prior to the drafting of the teams. Of course, oftentimes there are side bets or pools created outside of the sites itself as an agreement between the league members. This is generally done among leagues with people familiar with each other. These types of leagues are season-long commitments where players that are drafted by the user are on that team for the entire season unless the user decides to make moves. These moves can include trades with other league users, dropping players, and picking up free agents that were not drafted in the original selection process. The team owner monitors and runs the team throughout the season, matching up against another league owner in an effort to try and defeat that owner for the week. The most commonly played fantasy sport is the NFL, in which each week two teams go head-to-head for a win, which correlates to the overall record at the end of the season from which prizes are derived. CBSSports Fantasy - Multiple Levels Of Prize Leagues + Loaded With Tools! 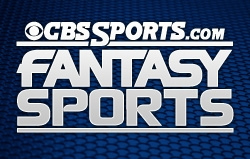 There are several different sports with fantasy leagues offered at CBSSports.com. First of all, this is one of the most-recognizable sites in sports and comes backed with a name like CBS attached to it which right away is comforting. And once users see what is offered in terms of fantasy leagues, that attachment only grows. Of course there will be NFL fantasy football, but other sports like basketball, baseball, and even golf are covered. CBSSports.com offers the chance to play for free with any league, or for cash + prizes. The satisfaction rating for users that have opted for CBSSports.com fantasy leagues is at an all-time high, and we certainly suggest checking them out and seeing what the site can do for you. The daily and weekly fantasy betting leagues take on fantasy leagues from a different direction. Rather than saying that users who enter into a fantasy league are committed to a single team through a draft process the full length of the season, this type of league says that users can enter leagues that are constantly changing. Each day or each week can be considered a new season which can provide for many different teams for a single user. The difference also comes with the chance to enter into different tournaments with your fantasy league teams where entry fees are considered your wager. Entry fees into tournaments will be all different amounts, so the user can enter into ones that they can afford with their budget. Depending on the type of player and how many tournaments they want to enter, the entries can all add up to a similar budget. For example, you can have a player that enters into 50 $1 tournaments, or 1 $50 tournament. Turn one season into many with fantasy league teams that can be created. Play for money and win cash, or play absolutely free; the choice is yours. FanDuel currently offers six different leagues that users can play. The NFL is at the head of the class at this website, but they have other tournaments too such as those for the NBA, MLB, NHL, college basketball, and even in college football too. There are four different tournament types that players can enter. There is a tournament with an entry fee, a head-to-head league against one other team, a league, and a 50/50 where the top half of the finishers wins prizes. The variety of options makes FanDuel one of the go-to betting sites for fantasy sports and a place we highly recommend. Keep Checking Back As FantasySportsWebsites.com Grows! After reading the info we provided above, we hope you have a good sense of what types of fantasy sports websites are available, how they operate and what to expect when you use them. But, we only had just a little bit of time to scratch the surface and all that we said can be considered to be just the basics. As FantasySportWebsites.com grows, our readers will continue to find more and more help with everything from funding accounts, winning money playing certain types of fantasy games and even learn about prize based promotions that can be entered for free at some of the major websites. If you wish to learn more, please take a few moments to browse through our website and find out what you've been missing. Within there will eventually be reviews of specific fantasy sports games websites that go into detail about what is offered, ways to win money playing fantasy sports, and several other important aspects which can be unique to that one website. Additionally, information on playing for free and risking real money on fantasy games can be located, and while Fantasy sports websites can be a lot of fun, know when you've reached your limit especially when playing for cash. We will even have a section about all types of legal online sports betting here in the very near future. For now, read through what we have and good luck on your fantasy sports adventures.